I'm not a huge movie fan, I think I have a pretty good sense of humour but I rarely go out of my way to watch a comedy, scary movies do my head in way to much. But I love movies that are make believe, science fiction, out there. I love all of "Lord of the Rings", Star Wars, all of the "Indiana Jones Movies", most of the "James Bond Movies", all of the "Harry Potter Movies" and I am really looking the the next one coming out later this year. I have had this passion for these type of movies for as long as I can remember. I recall as a little girl my favorite movie was "Alibaba and the Forty Thieves". I remember there were a few other Arabian Night theme movies I loved but I cannot remember their names. I guess I just love make believe. 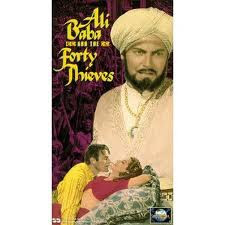 I remember Alibaba and the 40 Thieves, that was a great movie way back when! I remember Ali Baba and the 40 Thieves too. There's alwasy soemthign about "make believe" - it takes you out of your world and into a dream world of fantasy where you can be anybody you wish. Have all the Harry Potter books and read them all several times.